Charlie and I have accidentally started a Christmas tradition, and it turns me into a ridiculous, gushy bag of emotions just thinking about it. 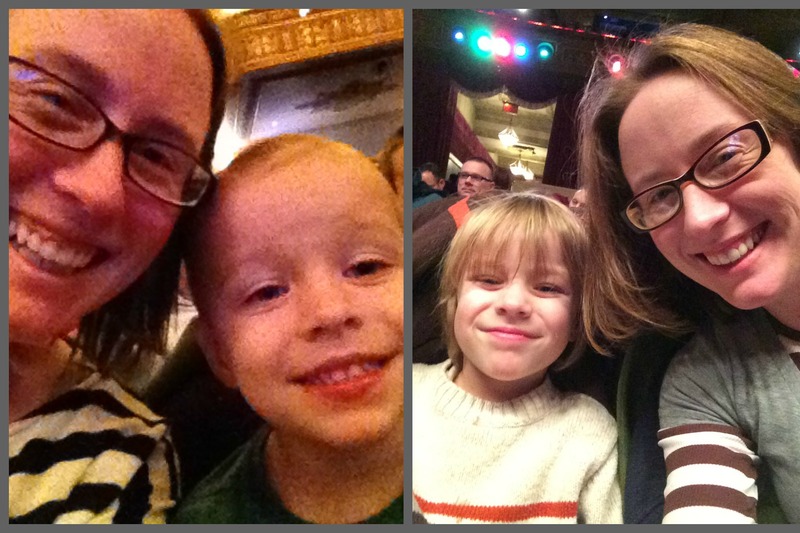 Last year, we went to see Elf the Musical together at the Orpheum, thanks to Omaha Performing Arts, and this year, we got invited to join my friend and her son in seeing A Christmas Story at the Rose Theater. Walking up to the theater holding an excited Charlie’s hand will never get old… even when I’m forcing him to do it as a 17-year-old. Last year, Charlie got a little upset at the tension before intermission during Elf, and fell asleep in Act II, but he still talks about it to this day. This year, at A Christmas Story, he stayed awake the whole time and only got a little distressed at a few of the conflicts that came up in the show. I don’t know if it was the fact that I was with Charlie, the show itself, or the amount of time it’s been since I’ve last seen a play… but I was emotional almost the entire time I watched that show. I’m sure it was a combination of all three factors. The show truly was wonderful. I have some lack-luster onstage memories of the Christmas Story production I was in in college, and this has done a great job of re-instating the love I have for the show. The original movie was a HUGE DEAL in our house during my childhood, and I’m happy to add more layers of love to it. The actors were pleasant and endearing, and the boy who played Ralphie hit some notes that made me almost burst into tears every time. I think what I loved most about the show itself was that there seemed to be a lot more love at the heart of it than there is in the movie… or at least obvious love, anyway. The father was a much more likeable character, and the relationship between him and the mother seemed more fulfilling. For the most part, Charlie was old enough for the show… there were only a few moments that he had a hard time with. The bullies and the breaking of the leg lamp got him pretty worked up, and he had difficulty understanding Ralphie’s bouts of imagination that were mixed in with “reality.” He thought the imaginary sequences were fun, but just couldn’t quite get the fact that it wasn’t really happening. The Rose Theater is GORGEOUS, and the people there were so kid-friendly, I could barely believe it. A replica of the department store Santa slide was out front, and Charlie and his buddy got to take a trip down it before heading to their seats. He says he would like to be in plays, too, and that’s so cool. Whether that’s true or he was just caught in the moment, it was incredibly heartwarming to share with him something that was once such a huge part of my life. He couldn’t believe that I had played the part of Esther Jane (one of the school girls), and was so excited to see which one she was. Another cool thing about all of this? If Charlie wants to take some little kid acting classes, he totally can. The Rose offers classes for kids 3-18 years old. THAT IS AMAZING. Can you imagine teaching a bunch of three year olds acting classes? I sure can’t, but the fact that there are people in town who can is just crazy, crazy awesome. So, big thanks to my friend for inviting us, thanks to the Rose for putting on such a wonderful show, and thanks again to Omaha Performing Arts for getting this tradition started. If you have a chance to go to the Rose or see a kids show put on by Omaha Performing Arts, please do. If you’re not in Omaha, but have a local theater, see if they’ve got children-friendly show. I think it’ll end up being a pretty special experience for you. Okay, I’m going to go somewhere and cry it out now. Thanks for reading.